grandma's cookie jar: A Girl for All Time Doll - Matilda - I'm Giving One Away! A Girl for All Time Doll - Matilda - I'm Giving One Away! On September 1, 2012 I'm giving away one Matilda, A Girl For All Time Dolls. 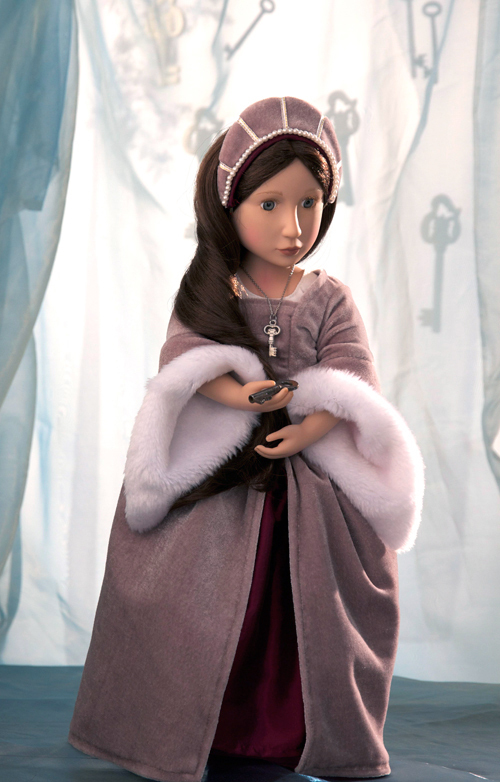 This doll is truly beautiful with her grey, velvet gown from Tudor times. I'm also including the book, Matilda's Secret, so you can know the story of Matilda. I really love how the Girl for All Times dolls follow the story of Matilda and her descendants - what a fun way to learn the history of England! With the recent Jubilee for the Queen, the wedding last year of Prince William and Katherine and the upcoming Olympics, England has certainly been in the news a lot! It is fun to learn about other places and times, so I thought I'd share some information on England which I found on the Girl for All Time website. Enjoy! I'm happy for the opportunity to give away on Matilda doll and you can be entered in this special drawing by first of all, "liking" grandma's cookie jar using the tab in the "find us on facebook" box ON THE BLOG. (You only have to do this one time - if you have already done so, you are entered in the drawing!) In addition, if you "share" my daily posts, you will receive an additional entry each time you "share"! (Please comment to let me know when you "share" so I can give you your additional entry) Plus, if you enter your email in the space to the right which says, "Follow GCJ by email" then you will receive an additional entry! I hope the Girl For All Time Dolls will catch on here in the United States - they are lovely dolls and they give American girls an opportunity to learn about what life was like for girls in England - throughout time!